This entry was posted in Chocolate, Cookies, Puddings, Sweet Stuff and tagged Chequerboard biscuits, chocolate mousse, Chocolate Week, Dan Lepard on 16/10/2011 by Joanna. Tidying up the living room today I found a carefully torn out page from the Guardian from July 24 2010. We loved the idea of dinner made with one pot, so Brian decided to make it. We had lots of little tomatoes, potatoes, all the ingredients and we wanted a meat-less meal so The New Vegetarian scored again! Brian says, you do need a second pot to roast the tomatoes, though I suppose at a pinch you could cook the tomatoes first and put them to one side and then carry on. If I was camping this might be the sort of dish that I could just about put together outdoors. I’m not very good at camping though. It’s a lovely supper dish and has those gorgeous Ottolenghi flavours, yoghurt, lemon, sumac, chili and tahini all cooked with a generous quantity of olive oil and I could eat it again really soon. The method of cooking the eggs, on top of a base of pan cooked potatoes and onions reminds me a little of baked egg dishes, it worked pretty well and even though it stuck a little to the pan, there wasn’t any left over! We followed it up by re-heating Suelle’s scrummy pear and chocolate pudding cake that I made on Tuesday and having it with yet more pears which I had poached in vanilla syrup, something I learnt from Azelia’s Kitchen which is in fact where I am popping back soon as she has a whole collection of fabulous dessert recipes for pears! We like pudding in this house, but we don’t have it very often, so it was great to have this to re-heat. I think we put too much of the chocolate pieces in the middle of the cake, so it ran in a rather nice gooey fashion everywhere. There are still lots of pears sitting neatly wrapped up in the garage. I will have to speed up and make some more puddings with them! This entry was posted in Chocolate, Puddings, Supper Dishes, Sweet Stuff and tagged Azelias Kitchen, chocolate pear pudding, Mainly Baking, ottolenghi one pan supper, tahini on 28/10/2010 by Joanna. This is my pic. I try to plant alliums and purple geraniums for the bees as they love them and the bees need all the help they can get these days. These (allium sphaerocepahlon or round headed leek) flower later than the big ones that we have in the Spring. We get visited by bees with many different coloured bottoms; red, white, yellow and orange, we get small honey bees, large bumble bees, solitary bees. I think there must be lots of bee keepers in Bristol. Sometimes they fall asleep on the alliums and I find them there in the morning waiting for the sun to warm them up. 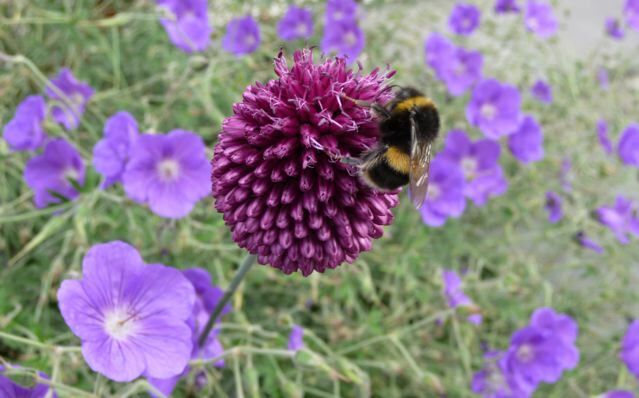 This entry was posted in Garden, Plants and Trees, Puddings, Wildlife and tagged allium, allium sphaerocepahlon, bee, Dan Lepard, Plum pudding on 13/07/2010 by Joanna.